When a plane arrives at its destination ahead of schedule, that’s a rarity. 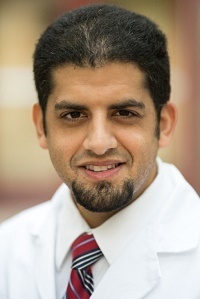 Akram Alashari, MD, a trauma surgeon and critical care physician at Grand Strand Regional Medical Center in Myrtle Beach, SC, is also a rarity—and he’s been ahead of schedule for quite some time now. Alashari earned his medical degree at age 23, and completed general surgery residency and became board certified at age 28. Hailing from Egypt gave him a slight advantage. And he hasn’t slowed down since. Alashari says he had no problems studying anatomy, physiology, and biochemistry at age 17. It was a few years later, after graduating from medical school at the top of his class and embarking on both a sub-internship at New York Medical College and his residency that he ran into some interesting challenges. For the first few months of his internship Alashari found navigating his way through the real life hospital system a bit intimidating. But he relied on his solid knowledge base to help him rise above the challenges. Still, there were frustrations—especially when it came to speaking with patients about performing their surgery. Developing that rapport, Alashari explains, is critical. He says that doing so helps improve patient outcomes, and what they remember most when leaving the hospital is how they were treated. Earlier this year Alashari published his first book, The Power of Peak State: Massively Enhance Your Personal Potential (CreateSpace Independent Publishing Platform, 2015). Peak state, as the book explains, is the integration of pinnacle mental capabilities with the optimum state of physical health and wellbeing. In other words, it’s a state of mind in which you have a heightened level of awareness, elevated mood and increased energy. Alashari says he wrote the book because many of his trauma patients are his age, or younger. They’re people in their twenties who often find themselves in need of his medical services because they’ve engaged in reckless behavior, such as drinking and driving, or texting while driving. Alashari says he has accomplished a great deal at a young age, but that there’s nothing inherently “special” about him. He attributes much of his success to reading—both inside and outside the field of medicine. That includes reading a lot about psychology and personal development. Alashari has always been drawn to education. He says that in medical school he used to give lectures to fellow students. He was even asked to prepare questions for the exam’s question bank to help fellow residents prepare. That love for education as well as public speaking—he’s given speeches countrywide at schools and hospitals about personal development, and won first place for best speech in the Toastmasters International Myrtle Beach branch competition—has served him well in his medical career. “It’s the major difference between your patients loving you or not wanting you as their doctor,” he says. Unfortunately, the nature of Alashari’s work often puts him in the uncomfortable position of having to deliver bad news to patients and/or their families. He says it’s critical to be able to approach and communicate empathetically at those times. However, he adds, medical schools do not teach students how to break bad news, establish rapport, and gain trust. Alashari is an avid runner, and follows a regimen of logging between 5 and 10 miles every day. But it wasn’t always like that. When he was a fourth-year resident he was constantly exhausted. The amount of physical activity he engaged in was minimal, he started to gain weight, and felt burned out. Then one day he decided things had to change—so he went out and ran. But he didn’t stop. Instead, he purchased a pair of running shoes and began running daily—first one mile, then two, then three—and before he knew it he was running 10 miles a day. He says it makes him feel great, clears his mind, and helps him visualize his future goals. But when he’s caring for his patients, his mind is firmly on their wellbeing.